Last week, SETsquared Bristol was pleased to welcome its newest member and tenant, Bristol Pound. The UK’s largest local currency, Bristol Pound, was launched in 2012 to create a stronger circular economy in the city. 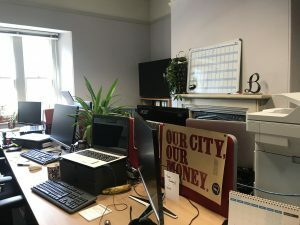 Bristol Pound moved into office space at SETsquared Bristol on Thursday 21st March and have joined the incubation programme to support the development of its digital currency. The alternative local currency is set to overhaul its current digital offering, making it more accessible to SMEs as well as larger strategic partners including the University of Bristol. “We applied to join SETsquared because we recognised that we are in a period of rapid change – we’re a brand new team with a brand new strategy for the Bristol Pound’s future development, so it will be great to have access to all the advice, support and training that SETsquared can offer. Bristol Pound brings a new kind of tech to the SETsquared Bristol roster, seeking to improve its access to data to improve the management of currency flow. 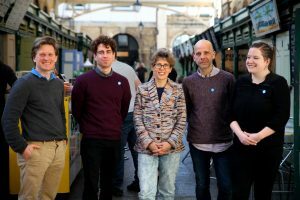 Bristol Pound is looking to attract funding and investment, engage more fully with businesses and communities across the city, and fine-tune its business plans. By encouraging people and businesses to support local independent businesses with their custom, Bristol Pound is helping to localise supply chains, keep wealth circulating in the city, and so create a more resilient local economy. Bristol Pound Managing Director, Diana Finch, was recently included in our blog celebrating female business leaders. You can read more about Diana and her work at Bristol Pound here. Find out more about SETsquared members here and sign up to the monthly newsletter to get SETsquared Bristol news direct to your inbox.